If you are looking for a lender, ExtraLend may be exactly what you need. It has been operating for more than 10 years offering reasonable conditions from a number of different lenders. In this review, you will find out more information about this service, including their ratings, conditions, and more. ExtraLend is located in Oakland, California, the USA. 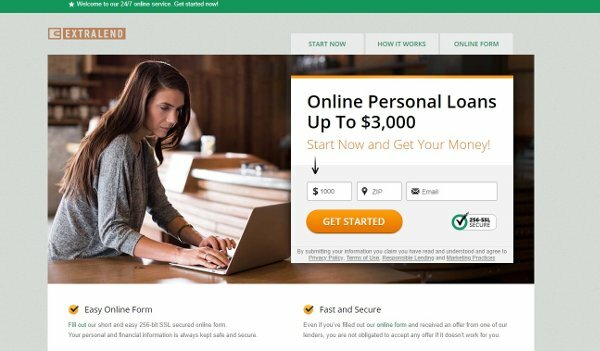 It has been offering personal loans since 2005, and today, they can be proud of building a large network of around 300 lenders, which allows their customers to find the best rates. Their service can be ordered online, by phone, and right at their offices operating from Monday to Friday from 9am to 6pm. You can contact their company via email or phone. There is also a helpful FAQ section on their website, allowing you to find out the initial information about the business and how it works. Penalties also depend on where you live and on your lender. However, you should be ready to pay penalties in case of late payments that may range from $20 to $40. You may need to send some papers by fax if it is required by your lender. On Trustpilot, the service has the rating of 6.6 out of 10 based on votes of 41 customers. There is only one review within the last several months that gave the company 1 out of 5, complaining about spam. The business’s rating on 10bestpersonalloans.com is 4.7 out of 5, and it is considered the second best service provider among six different loan companies. There are no reviews of this company that can be found on the BBB website. The service is very convenient, and it is possible to apply for a loan in different ways, including an online application form. Thanks to a large network of the lender, customers can find the best conditions within only several minutes. Their conditions mainly depend on the lenders and the state of the borrower, but the maximum APR that can be offered is pretty high. The service has pretty good ratings on several websites, and there are not many customers giving it an only 1 star. All in all, ExtraLend.com can be recommended to consider if you need to borrow some money up to $3,000.